The fact that cows are big animals is not news. What is noteworthy, however, is the fact there is a cow out there that quite literally towers above the herd -- standing as tall as Michael Jordan and tipping the scales at a whopping 3,086 pounds. His name is Knickers, and he's freaking huge. 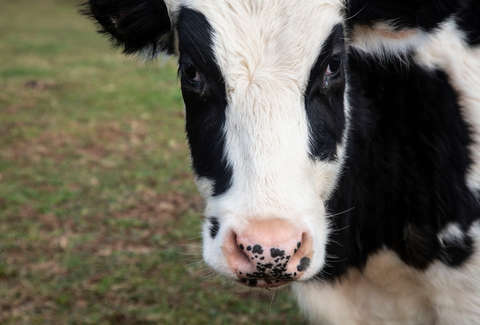 The steer in question, a 7-year-old Holstein Friesian, has become quite the sensation in western Australia, where he lives. At 78 inches, he stands significantly taller than the 58-inch average for the breed, per the BBC. In fact, he's just two inches shorter than basketball legend Michael Jordan. He also weighs over a ton and half, or roughly double the average for his type. His owner, Geoff Pearson, has declared him Australia's biggest steer, and frankly, who are we to argue. Due to his large size, Knickers' life has been quite a bit different than that of his fellow cows. For one, because he's so big, Pearson spared him a trip the slaughterhouse with the rest of the herd his age to wait and see if he was going to stop growing. "He was always a standout steer from the others, a bit bigger than the rest," Pearson said in an interview with the BBC. "He was still a standout so we thought let's leave him there, he's not hurting anyone." However, Knickers never really stopped growing, and now he's basically too big to sell. When he was put up for auction last month, meat processors said they wouldn't be able to handle him due to his size, so now it looks as though he'll get to live out the rest of his years naturally. He's a hit among the current herd, too. According to Pearson, the rest of the cattle (he owns about 20,000) follow him around everywhere. It's unclear if he'll keep growing, but if he does he'll need to reach about 80 inches if he's to make the record books. It's possible, though, since Pearson thinks he probably has a few years left in him. So, if you happen to find yourself in Myalup, Australia in the near-future, keep your eyes peeled for an exceptionally huge black and white beast roaming in the grass. He shouldn't be hard to spot.